My family doesn’t celebrate Christmas, and we have no use for Christmas stockings. Yet this stocking is precisely and particularly for Mr. Sweetness (he chose it himself!). The next one will be for me, and even Her Royal Furriness Princess Kitty will get one, in time. Today is February 22nd, which means either Christmas is two months behind us, or a long ways away! 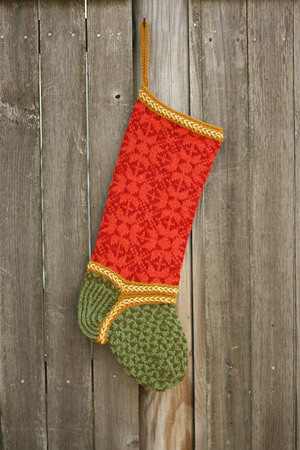 But it’s snowing today, which makes it a perfect day for a Christmas stocking. Pattern: Judy’s Colors Red Velvet Christmas stocking kit. Needles: US 4 Susan Bates 16″ circular needle and dpns . Knitting doesn’t need to follow the rules of logic; it only has to make sense in our heads and hearts. Beautiful! You have perfect knitting! Love it! It’s stunning. Those braids are a little bit of a pain to make but they’re so beautiful! When you’re happy and in love, everyday should be like Christmas! Beautiful stocking! Oh, I love those braids! I made this for my daughter last December (along with St. Mark and Gold Brocade for my other two). Great stocking in wonderful colors, and a fun knit at that. Good luck and enjoy it! That’s beautiful! It’s funny because I’ve been meaning to knit a Christmas stocking soon too. I’ve been swatching the colorwork for practice, and will start soon hopefully. Knowing you, this project makes total and complete sense. OMG, I love it!! I think I need one. This looks like a Spring Festival stocking to me! The colors are faboo! 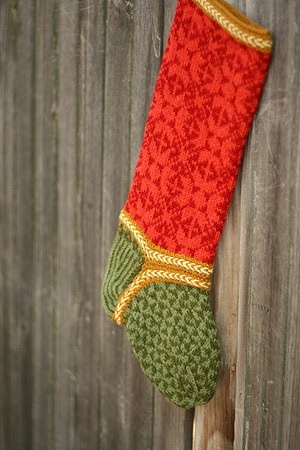 This is a gorgeous stocking! They make lovely organizers and catch-alls? Wow! Judy has unvented the un-Christmas stocking, and your execution makes it an art form all its own. Can it hold flowers, perhaps? I want to knit all four of the judy’s colors stockings SO BAD, so I’m severely jealous. It’s so pretty! Your stocking came out very nice! For me it is perfectly ok for any knitter to try this out, even if she does not celebrate Christmas. Most Christmas rites are not christian anyway but much older, heathen ones. So knitting nice things to brighten your days ist the same as putting up green twigs and red apples and adorning oranges with good smelling spices. You last sentence is perfect – thank you. Which by the way is gorgeous, I love those colors. I have been lusting after those stockings on the web. *sigh* I want to make almost all of them. They are gorgeous! And so what if you don’t see a need for them – your friends who celebrate Xmas might drop a small gift in them here and there *grin* if its yarn – more the better. 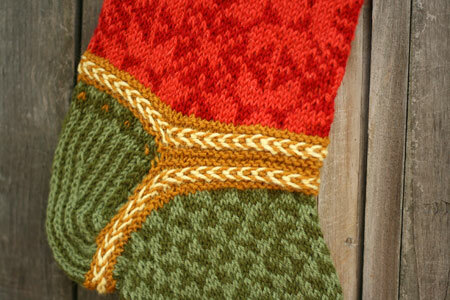 How was the top of the stocking to knit – from a far the colors look crisp = but the closer photos the two reds (or oranges) looke very similar in hue – was it a tricky knit? It’s never too late/early for a Christmas stocking! That is BEAUTIFUL! But then again, everything I ever see over here is beautiful. I suggest you take up the tradition of stockings — I think it would work with or without Christmas. Perhaps you could have birthday presents stowed in stockings instead?? My theory on the stockings this year when I frogged it two weeks before Christmas was that my son was way too young this year and now I have until next year to finish it! Perfect time to be making stockings.